The bulk of our abdominal muscle training should come in the form of core stabilization exercises. Far too often, we have been misinformed that the best way to train abs is through flexion. The ab wheel rollout is an extremely effective exercise in training the core stabilizers and in strengthening the abs the correct way. Don’t underestimate this exercise, performing it correctly is a lot harder than it looks. Roll out only as far as you can keep you low back straight! This can lead to lumbar strain. You must keep your core tight and engaged the entire time. If your low back bends (arches) during the roll out, stop the exercise. Only roll out as far as you can keep it straight. Over time you will be strong enough to reach full extension. This can lead to shoulder and chest tendon strain. Lock your shoulder blades into position by retracting your scapula. The only movement from your shoulder should come from flexion as your body is extending down. At no point should your shoulders move in any other direction. Can I Do Ab Wheel Rollouts With A Barbell? Yes, just load up the barbell with short plates (10 lb plates should do the trick). The exercise is exactly the same. Interestingly enough, loading the barbell with heavier weights will not make the exercise more challenging. The challenge lies in being able to maintain a neutral spinal position, not in pulling the weight back towards you. I’m A Beginner. Can I Do Ab Rollouts With A Stability Ball? Sure. The only thing you have to understand is that the bigger the ball, the easier the exercise becomes. If you are an absolute beginner, this can be a good variation for you to do. Simply place your hand on the ball and rollout using the the same technique mentioned above. How Can I Do Ab Wheel Rollouts From A Standing Position? This is a very advanced core exercise that should only be attempted by trained individuals. With that said, Ross Enamait has a great ab wheel rollout progression to teach you how to do this exercise from your feet. I haven’t yet mastered this exercise, but I plan to in the future. I Don’t Feel The Ab Wheel Rollout In My Abs. What Gives? Many people will feel this exercise in the chest and arms rather than their core. This is because you are focusing on too much on moving the wheel back and forth. Instead, you need to concentrate on simply splaying your body forward while keeping your core extremely tight. Practice pausing at the bottom of the movement for 1 second and then come back up by squeezing your abs even harder. I guarantee you will feel it it. If you are experiencing pain, stop the exercise. Back pain during AWR is usually due to poor technique, i.e letting your lumbar spine extend. Your back should never change its alignment during this exercise. It actually helps to concentrate on rounding your back slightly by hallowing in your chest and core. Maintain this position throughout the movement. If you still have pain, then focus on performing planks in the mean time. This is probably because you are letting your shoulder internally rotate too far when doing this exercise. Before you start the exercise, retract your scapula and screw your shoulder blades back into their sockets. Maintain this position throughout the entire movement. Do not let your shoulders come out of their sockets. If you still experience pain, then focus on stretching your chest and your shoulders. Is There An Ab Wheel Rollout Routine I Should Follow? Your core is a muscle group just like any other. You do not have to train it every single day. Performing at least 3 sets for 6-12 repetitions, 2-3 times per week will be more than adequate to get the results you desire. Which is Better? Ab Wheel Rollouts or Dragon Flags? They are both great exercises. Neither is better than the other. I personally prefer reverse crunches/dragon flags as they require less equipment. 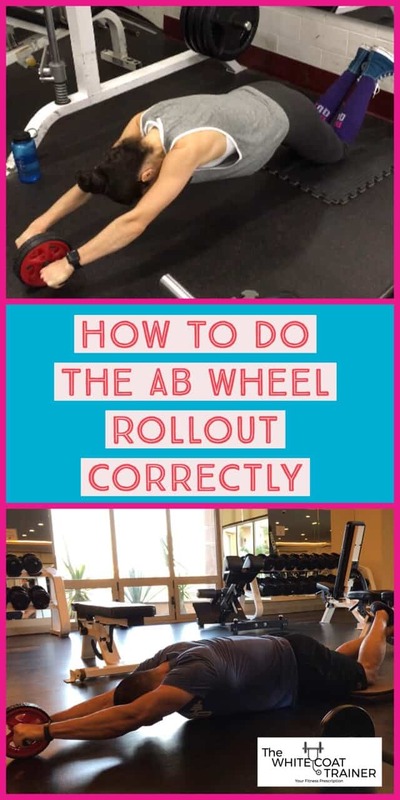 Check out our workout template for busy individuals to learn how to incorporate the ab wheel rollout and every other functional exercise into your training routine. Did you like this tutorial? Be sure to check out our article on all the best exercises detailing a bunch more!